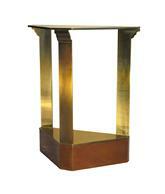 Highly architectural delta shaped brass clad console table. Front column shows reverse architectural capital form. Patinated brass finish. Very good condition, with some finish damage to top (see photos). This item is extremely heavy with an unseen structure underneath the brass of either steel or cement (for balance). Likely an original prototype, ex-Baker Grand Rapids Design Office. 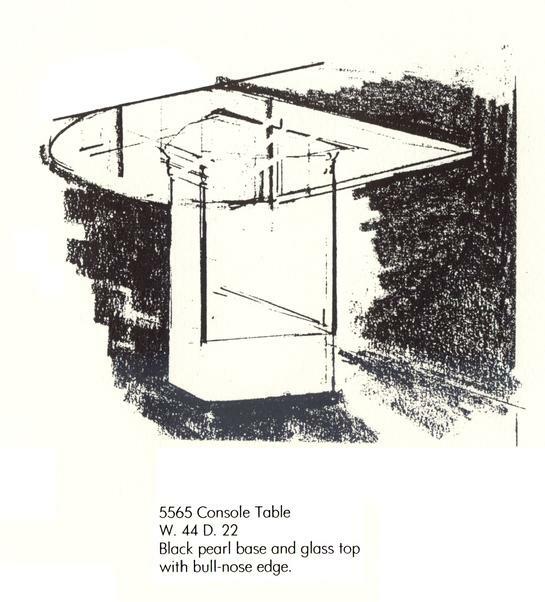 While the original Baker press materials indicate a glass top to this table, this item has never had nor does now include a top of any kind (although marble / stone could be especially attractive, if something additional were desired). Acquired from former Baker sales executive, purchased and removed from Baker Grand Rapids factory, 1986.